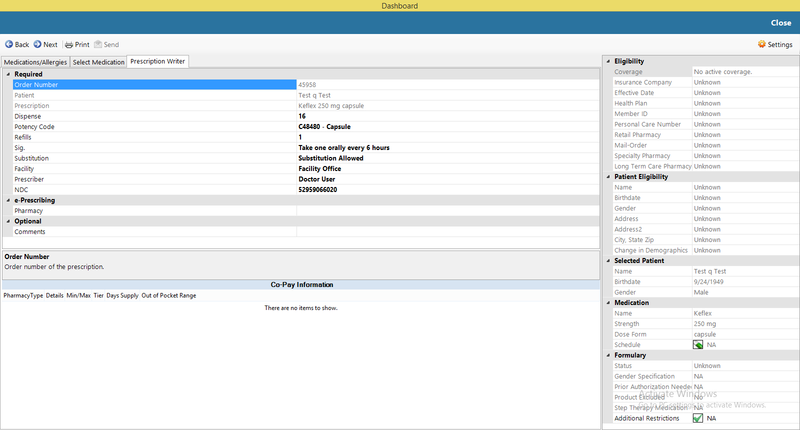 E-prescribing in TRAKnet 3.0 utilizes a built in Surescripts interface to send electronic prescriptions. From Patient’s Chart, with the Rx button. Back and Next: These arrows will allow you to move through the various steps of the Prescription Wizard. Print: This will become active after all steps have been completed and will allow you to print the prescription. Send: This will become active after all steps have been completed and will allow you to electronically send the prescription through Surescripts. Messages: This will allow you to view all incoming and outgoing refill and prescription requests as well as a history of all electronic prescriptions sent from your office. 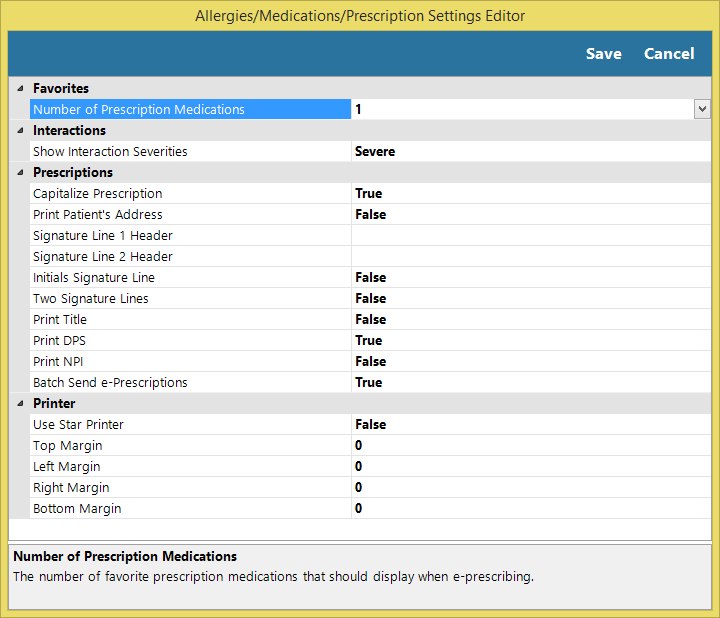 The first screen of the e-prescription wizard is the Medications and Allergies tab. On the Medications and Allergies tab, you can view and/or add to the patient’s medication and allergy history while using the Prescription Wizard. From the Medications & Allergies tab, you can add, modify, or delete a prescription or allergy as well as check interactions between medications and allergies. To view more information about a currently existing medication or allergy, click on the medication/allergy then click Modify. Click on “Check Interactions” to open the Drug and Allergy Interactions for the current patient. The system not only checks Drug-to-Drug Interactions, but also Drug-to-Allergy Interactions. Highlight either the Drug-to-Drug Interaction or Drug-to-Allergy Interaction for specific detailed information on that interaction. The Eligibility feature on the right-hand side of the screen will preview all medication eligibility information as it pertains to the selected patient, if it is available. If your user has permission to do so, you can override the severity of the Drug-to-Drug or Drug-to-Allergy Interaction. 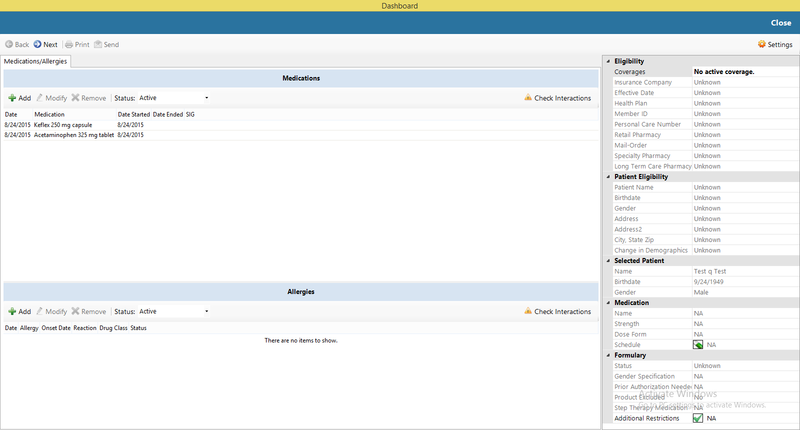 “Add” in the Medications portion of the Medications/Allergies screen allows you to add current Medications. To add medications to the current patient’s chart, search for and highlight the appropriate medication on either the Favorites, LexiComp or Surescripts® tab and then click “Add.” TRAKnet 3.0 will build the Favorites list for you based on prior searches and selections. LexiComp is a commercial drug database. Search the LexiComp database for medications to add to the patient’s chart by typing the medication in the search box and hitting the Enter key. If the patient’s medications are stored on the Surescripts® database, the Surescripts® tab will provide a list of these medications. “Add” under Allergies opens the Patient Allergies window. To add allergies to the current patient’s chart, search for and check the appropriate allergy on either the pre-set list or the allergy database. There are three tabs to search through: Favorites, LexiComp, and Unique Ingredient Identifier. The Favorites tab will be comprised of the most common allergies present in your database. 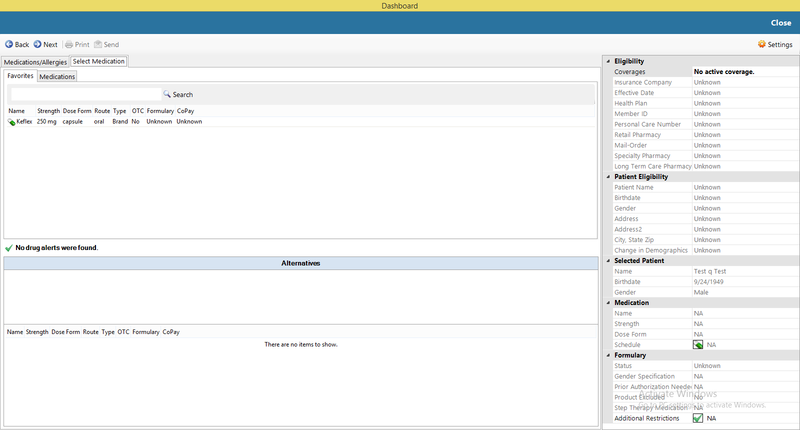 The LexiComp tab will allow you to search for all medications from the LexiComp database of medications. You must search by drug name, not brand name. The Unique Ingredient Identifier tab will allow you to search all allergens by the component ingredient; for example, all sulfa- allergens. Once you have completed adding all Allergies to the patient’s chart, click “Next” to access step 3 of the Prescription Wizard, the Select Medication tab. To select the medication you want to prescribe, search for or highlight the appropriate medication on either the Favorites or Medications tab. When you select the appropriate medication and dosage, you can review further information about the medication by double-clicking your selection. This will access the Medication Properties window. The Medication Properties window will display specific packet size, pharmaceutical manufactures, NDC (National Drug Code), average pricing and an image of the medication, when available. After selecting the medication, the NDC will automatically fill in when proceeding. It is also possible to choose an NDC code manually, if necessary. 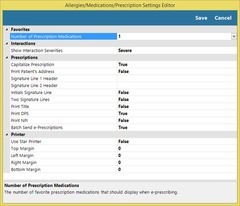 The lower section of the Prescription Properties window has two additional tabs: Patient Education, which can be printed by right-clicking and selecting “Print” and “Additional Information” which may include information such as active ingredients, allergy classes, dosing, duplicate therapy, indications, pharmacology, side effects and warnings. You can click the + symbol next to each line item to view more information about this medication. Click “OK” or “Cancel” to close the Prescription Properties window. Once you have selected the appropriate medication and dosage the system will check for Drug-to-Drug Interactions and Drug-to-Allergy Interactions. If there are any Drug-to-Drug Interactions or Drug-to-Allergy Interactions, the “Drug alerts were found” warning will be displayed. Click on the “Drug alerts were found” warning to access the medications alert. Highlight either the Drug-to-Drug Interaction or Drug-to-Allergy Interaction for specific detailed information on that interaction. If you do not click on the “Drug alerts were found” warning, the system will automatically open the Medications Alert window when you try to proceed to Step 4 of the Prescription Wizard. If your user has the permission for “Adjust Drug Notifications,” you can override the severity of the Drug-to-Drug or Drug-to-Allergy Interaction. Click “Next” to access step 4 of the Prescription Wizard, the Prescription Writer. Order Number: The order number will automatically be filled in. Patient and Prescription: The patient and prescription will populate based on prior selections. Dispense: This is the amount of the selected medication you wish to dispense. Potency Code: Potency Code will automatically populate based on what code is relevant for that medication. If the Potency Code does not populate, one can be selected from the drop-down menu. Potency Code is mandatory to send any prescription. Sig: After you select the Medication and Potency Code, Sig will automatically populate based on the standard prescribing instructions used most frequently in your office. You can override the Sig after it is automatically populated. 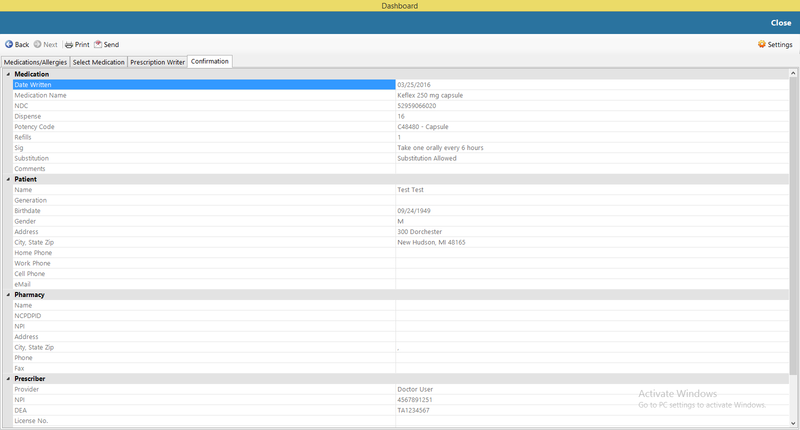 In the prescription writer, there will be a dropdown allowing the selection of all previously used Sigs. Substitution: Set here whether or not substitution is allowed on this medication. Facility: Selected based upon the facility you are currently logged in under, this can be overrode on this screen. Prescriber: Selected based upon the provider you are currently logged in under, this can be overrode on this screen. NDC: This will be automatically populated based on the medication that is selected, pulled from the LexiComp database of medications. Patient’s Favorites – Builds automatically based on prior searches and selections for this specific patient. My Favorites tab – Builds based on prior searches and selections by the prescribing provider. Retail tab – You can search for the appropriate pharmacy based on Zip Code or City and State. The Mail Order tab – Lists all mail order pharmacies that Surescripts® has contracted with. Comment: An optional message to the pharmacist can be sent here. This section is for information related to, but NOT part of the directions for, the prescription. 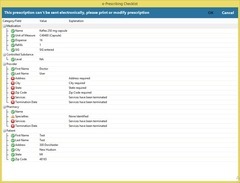 When available, the lower section of the Prescription Writer window displays the co-pay information, pharmacy type, details, min/max, tier and day’s supply. Click “Next” to access the final step the Prescription Wizard, the Confirmation window. The final tab of the Prescription Wizard is the Confirmation tab. Here you can review all data to ensure it is accurate. If any information is inaccurate, return to the appropriate tab by selecting the desired tab from the top of the Dashboard, and make corrections prior to completing the prescription. If all information is correct, click “Send” or “Print” to complete the Prescription Wizard. Depending on what option you have selected, clicking “Send” will send the prescription electronically to the selected pharmacy and “Print” will print the prescription to the printer you have selected. 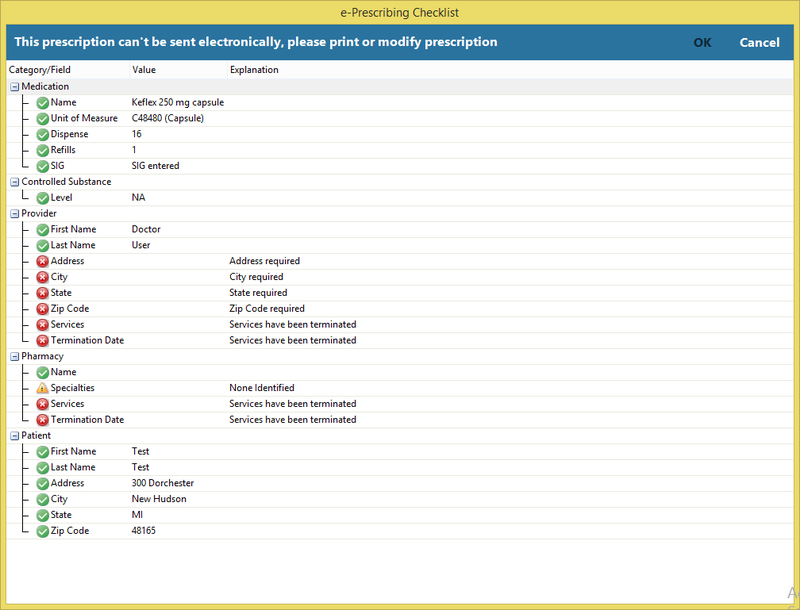 After printing or sending a prescription, a prompt will pop up asking "Write another prescription for this patient?" Selecting "Yes" will reset the process to Step 3 (selecting a medication). This can be done for as many continuous prescriptions as needed. If there are any errors after choosing to send an e-Prescription, a checklist will appear detailing each item preventing the e-Prescription from being sent to the pharmacy. There are several settings that can be modified and set up prior to writing a prescription. These settings can be accessed by clicking the Settings button in the upper right hand portion of the Prescription Wizard screen. Favorites: This category contains one setting, Number of Prescription Medications, which determines the max number of items that will be displayed on the Favorites tab of medications. Interactions: This setting will adjust the severity level at which an interaction is to be reported. The severity level selected will include those and any that are considered higher. Prescriptions: These settings primarily pertain to the formatting of printed prescriptions. Capitalize Prescription: When set to True, this will capitalize the entire prescription. Print Patient’s Address: When set to True, this will print the patient’s address on the printed prescription. Two Signature Lines: When set to True, this will use a two-line prescription format. Print Title: When set to True, this will print the title after the name of the prescriber. Print DPS: When set to True, this will print the DPS of the prescriber on the prescription. Print NPI: When set to True, this will print the NPI of the prescriber on the prescription. Batch Send e-Prescriptions: When set to True, this will allow e-prescriptions to be sent as a batch. Printer: These settings pertain to how prescriptions are printed. Use Star Printer: If True, prescriptions will be formatted to print on a Star brand printer. Top Margin: Determines how much space is made at the top of the printed prescription. Left Margin: Determines how much space is made at the left of the printed prescription. Right Margin: Determines how much space is made at the right of the printed prescription. Bottom Margin: Determines how much space is made at the bottom of the printed prescription. Only providers who have gone through the identity proofing process may e-Prescribe controlled substances. The provider may e-Prescribe a controlled substance from any workstation with the SafeNet software installed and the USB Authorization Token plugged into an open USB port. Once the clicks Ready to Sign to send the e-Prescription, the provider will be prompted for their IdenTrust passcode, after which the e-Prescription will be sent to the pharmacy. Measure: At least one permissible prescription written by the MIPS eligible clinician is queried for a drug formulary and transmitted electronically using CEHRT. Search for a patient. Open patient. Measure: More than 40 percent of permissible prescriptions written by the EP are queried for a drug formulary and transmitted electronically using CEHRT. While the below video directly references the old measure, the steps are still the same for the revised 2015 measures. While this is no longer a requirement in Meaningful Use in 2015, the below videos are left archived as a demonstration for documenting patient medications and allergies.